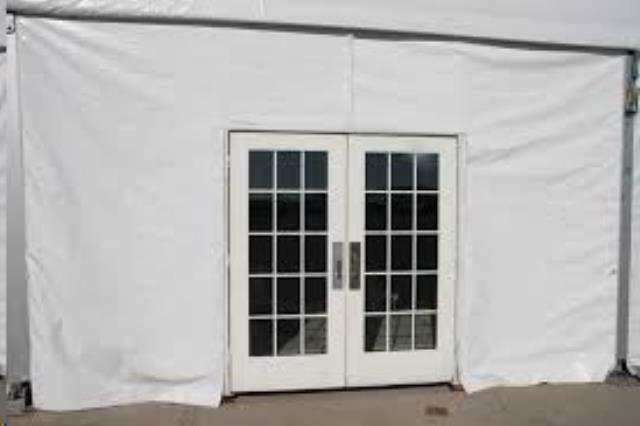 THIS IS A SOLID DOOR ON HINGES THAT OPENS TO THE OUTSIDE AND ATTACHES TO THE TENT FRAME. THIS ITEM MUST BE USED WITH SIDE WALL. DOOR AND SIDEWALL DISTANCE HAS 15' AND 20' OPTION. * Please call us for any questions on our tent door double french style rentals in Tacoma, Lacey WA, Olympia and the South Sound Metro area.